Description: Artemis is interested in what is unknown about the places that are most familiar to us. She explores the layered geological identity below the surface of the site, with an invitation to wonder at the dynamic systems of the planet that sustain us as they manifest locally. 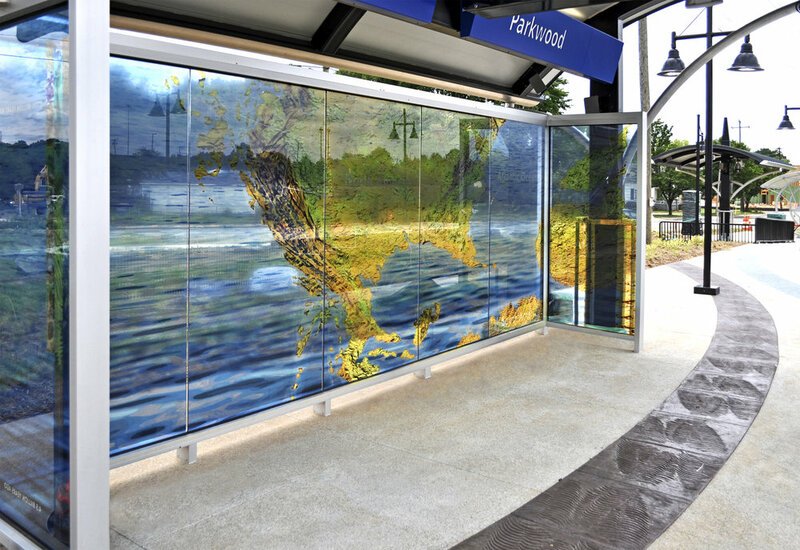 The Parkwood Station platform and adjacent park become a physical and visual narrative referencing local geology, plate tectonics and water’s role in fossil and gold formation. The physical, tactile presence of stone in the landscape and on the platform embodies these past geological events. Through the richness of physical and visual elements, her work invites station users to enjoy their surroundings as well as to seek knowledge beyond their initial experience. 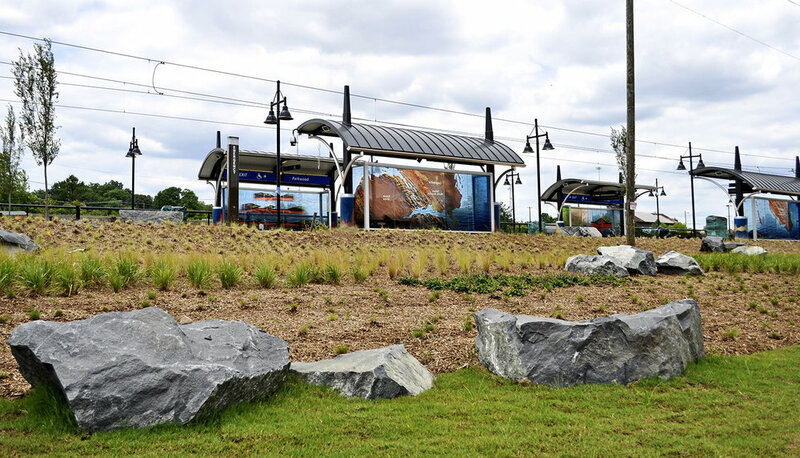 Charlotte and its immediate environment are divided, according to the US Geological Survey, into two distinct areas: The Charlotte Belt, which lies beneath the center of the city, and the Carolina Slate Belt just east of the Charlotte Belt. These are referenced in the windscreen imagery on the southbound station platform as well as in the adjacent park. The boundary between the two belts runs in a northeastern direction and the grass-covered path crossing the park marks the same directional orientation. Local stone from each belt marks each edge of the path, echoing in miniature the boundary between the two geological areas. The geological themes expressed throughout the station in the windscreen imagery, the column cladding, the paving treatment, and carved granite benches, differ for each platform yet are in conversation with each other. Paving patterns: Both platforms include arcs of integral colored concrete with a custom designed stamp representing the pre-Cambrian fossil described below and featured in Windscreen 1. on the southbound platform. 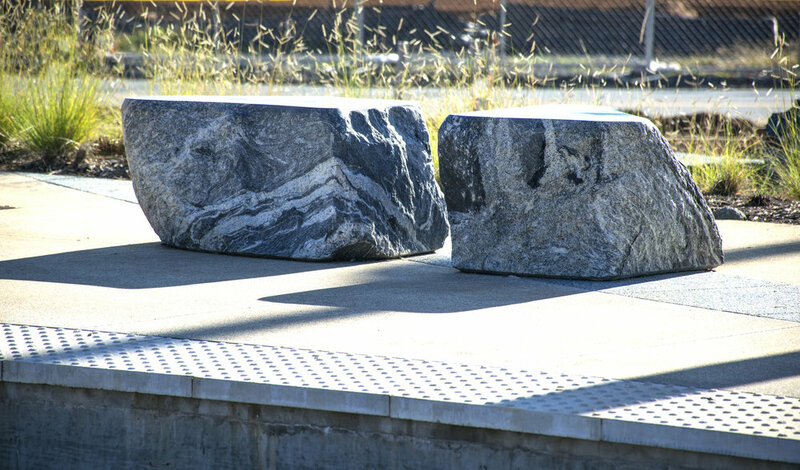 Sculptural Benches: Hand worked granite benches are placed at two locations on each platform. 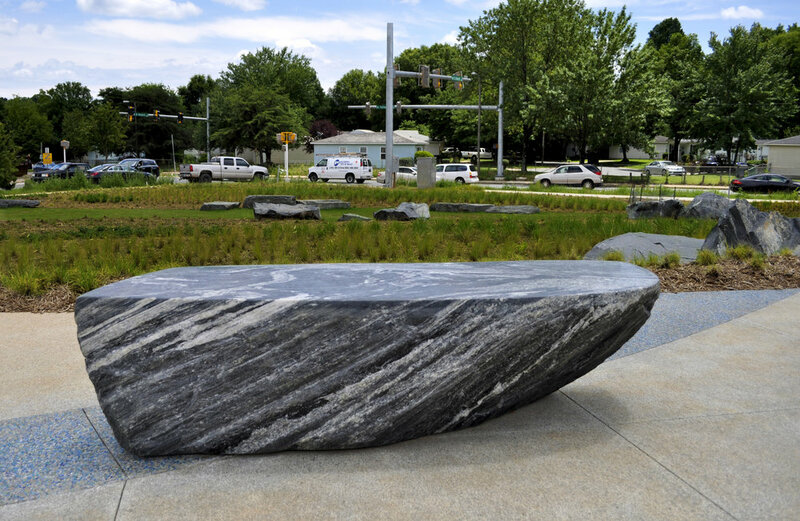 The granite for these benches was quarried in Elberton, GA, where the two geological belts mentioned above narrow and become indistinct. 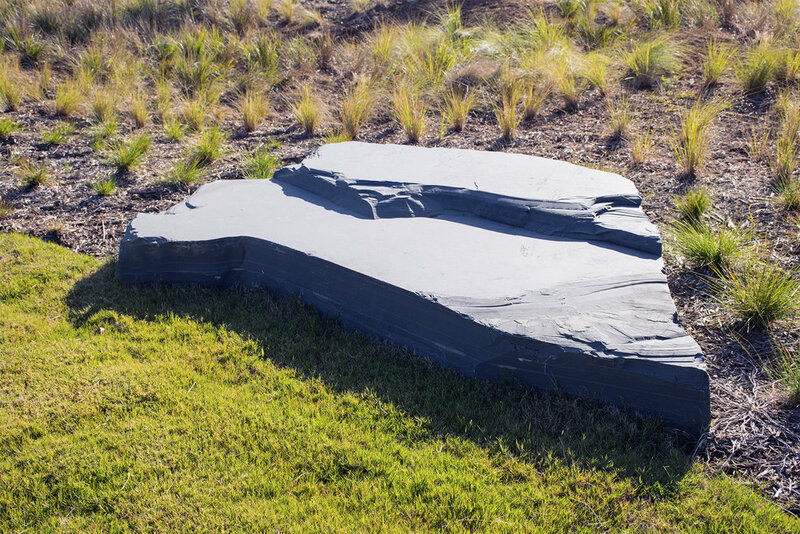 The source of the bench stones is a reminder that the geological event [orogeny] that created contemporary landforms in North Carolina, also contributed to the formation of the Appalachian Mountains, and much of the eastern part of North America. © paleographic maps in the collaged images for the northbound windscreens.